My intention for this hike today was to climb Ledge Hill in Schroon Lake. My start point was the end of Wamsley Road, which is a side road off of Trout Brook Road, which is a side road off of Hoffman Road (County Route 24). I parked at the end of Wamsley at about 1 PM. From there, an old road (Charley Hollow Road) makes it's way into the woods. The road is no longer driven on, but it is part of the snowmobile trail network in the wintertime. I followed the woods road to the height of land, then turned right to begin a bushwhack. To get to the hills to the south, you have to cross Alder Brook. A large portion of the brook in this area is flooded by beaver or marshy. I had to go a little more southerly than I would have opted for in order to find a place to cross the brook. Once I got across the brook, I turned southeasterly to head towards Ledge Hill. As I was walking, I began to think that Ledge Hill might be further than I wanted to go since it was now mid-afternoon. At this point, I was almost directly north of Pine Hill and I could shoot right up the northern ridge to Pine. I changed course and headed for Pine instead. The woods were easy to negotiate and the ridge was easy to follow. At two point along the way, I passed slabs of rock where I could stand and get views northward. After an hour and a half of walking, I was in top of Pine Hill (southern peak). I hadn't expected much of a view of Schroon Lake because I thought Ledge Hill would be in the way, but I could see most of the northern half of the lake. I also had a good look at Ledge Hill so I'll know how to tackle it next time. There was a nice breeze here that kept the bugs at bay. A couple deer flies had been after me but they weren't biting yet. Looking SE from Pine Hill. I-87 can be seen in the background. The rock looked wet, but it was just brown moss. Pine Hill has a double summit so I headed over to the northern peak. At this location is a Verplank Colvin survey marker and eye bolts from an old survey station. There wasn't much in the way of views from the northern peak. To head back, I dropped off the northern peak and angled my way back to where I had crossed Alder Brook. I could tell when we reached the location of my ascent because my hound dog Rev picked up the scent and continued to follow it straight to the brook crossing. Once across the creek, I made a more direct line towards the car even though it was a little more hilly. This was an easy place to walk with the exception of finding a place to cross the brook. 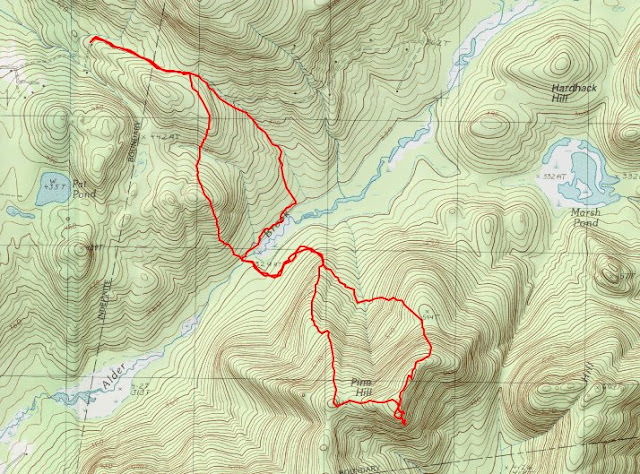 On my next trip to this area, I'll head in the same way, but continue on to Ledge Hill to see what it offers.